Jazz music has always been associated with New Orleans, widely considered the genre’s birthplace. But another long-lived form of music has become synonymous with the city in recent years: the brass band. Treme has given solid screen time to local legend Kermit Ruffins and his standing Thursday-night gigs at Vaughan’s with his band The Barbecue Swingers. Kermit’s laid-back style embodies the “Big Easy” label, easing through jazzy shuffles with occasional bursts of unadulterated, brassed-up joy. But determining which brass bands to follow can be daunting. Glance at the Jazz Fest lineup from any year and you’re bound to see at least a dozen different local acts. And those are just the ones playing at the fest; there are dozens of other smaller brass bands spread throughout the city. While there are a slew of traditional brass bands keeping an older style of music alive, a new generation of players has pushed the form along, mixing it with elements of funk, R&B, hip-hop, and rock, creating a fusion that bridges the generational gap as it moves the genre forward. Why: Founded in 1983 by brothers Philip and Keith Frazier and the aforementioned Kermit Ruffins (who amicably left the band in the early ’90s), Rebirth Brass Band has seen its popularity skyrocket thanks to its mix of traditional music with elements of hip-hop and funk, an intersection of past and present that appeals to multiple generations. Tireless touring and a standing engagement every Tuesday night at The Maple Leaf in New Orleans’ Uptown neighborhood have also burnished the band’s reputation. Rebirth has made numerous appearances at festivals far and wide and is featured on Treme, including a prominent spot in the series-opening second line scene. Having rolled its way through almost a dozen albums—the latest, Rebirth Of New Orelans, just dropped a few weeks back—and several live compilations, Rebirth also took the lead in touring the nation post-Katrina. All nine members lost their homes in the storm and found themselves in different corners of the country after evacuating, but they reassembled just weeks later to tour without missing a single date, becoming something like artistic ambassadors for the city. And it’s in a live setting where Rebirth is best enjoyed, blaring its horns to the swaying, sweaty masses, either inside a claustrophobic club or in front of thousands of Jazz Fest attendees. Trumpets and trombones weave a tapestry of melody while the tuba provides the underlying bass and the syncopated drums set the rhythm, effortlessly switching from march to hip-hop beats and back again. Whether it’s belting out “Do Whatcha Wanna,” snapping out “Feel Like Funkin’ It Up,” or collaborating with one of New Orleans’ many homegrown hip-hop stars like Cheeky Blakk or (the now-deceased) Soulja Slim, Rebirth has surpassed The Dirty Dozen Brass Band as the emblematic brass band of 21st-century New Orleans. Like Rebirth, Soul Rebels Brass Band also infuses its music with elements of funk and reggae, but it plays up the hip-hop elements, particularly in a live setting, where it uses vocals more than most brass bands. The different styles sometimes threaten to overpower each other, making the group’s studio output a bit uneven. But, like Rebirth, Soul Rebels puts on a great live show, particularly its weekly Thursday-night shows at Le Bon Temps Roule, where the setlists include traditional rollicking originals like “Let It Roll” and several fun, funked-up covers like Beyoncé’s “Crazy In Love.” If the Rebels’ studio albums seem a bit scattered, the band’s live sets are balls-out, horn-blaring romps. 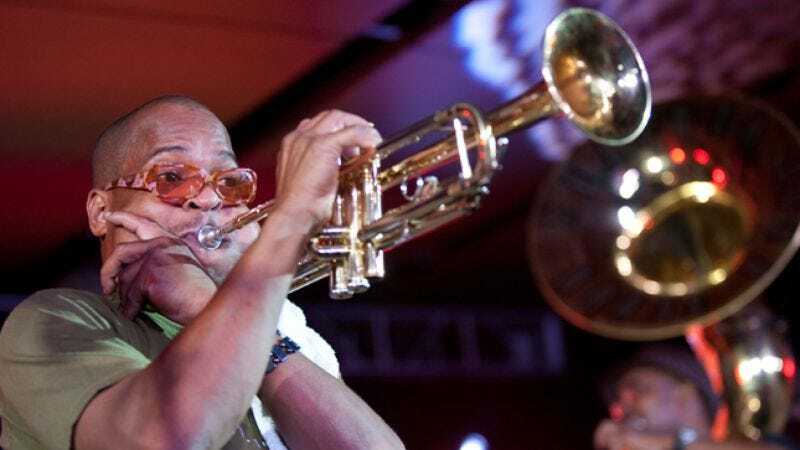 Two other artists in the same vein as Ruffins that are worth checking out: Trombone Shorty (real name Troy Andrews—and he plays the trumpet, too) and his band Orleans Avenue, and Irvin Mayfield Jr. trumpeter and frontman of Latin jazz combo Los Hombres Calientes. Both Shorty and Mayfield are graduates of the New Orleans Center For Creative Arts, and both became local sensations in their teens. Shorty mixes brass-band oomph with the usual funk and R&B, but throws in a heavy dose of rock, creating an energetic hybrid that bridges genres. He’s become one of the prominent young faces of New Orleans music in the wake of Katrina thanks to constant touring, signing with a major label for his last album—2010’s Backatown, which included “Something Beautiful,” a sleek collaboration with Lenny Kravitz—and numerous national television appearances, including the occasional cameo on Treme. Meanwhile, Mayfield Jr. has prominence of another sort, serving as the official cultural ambassador of the City Of New Orleans in addition to a host of other duties including: founder and artistic director of the New Orleans Jazz Orchestra, chairman of the board of the New Orleans Public Library, and several other community board positions. Oh, and he’s an amazing jazz composer and trumpet player. As the population make-up of New Orleans has shifted in the years after Katrina, seeing an influx of Latino residents, Los Hombres Calientes fills a niche, combining jazz with salsa, Caribbean, and Latin grooves that are just as danceable as their more funk-oriented counterparts. A more left-field pick, Bonerama takes a unique approach to the brass-band concept. While its music includes the usual mix of traditional brass, jazz, and funk, the band consists mainly of several trombones, creating a massive, layered wall of sound. Bonerama also deviates from some other brass bands by drawing heavily from classic-rock plays: Covers of Led Zeppelin and Jimi Hendrix often figure into its sets. After collaborating with indie-rockers OK Go in 2008, the band got its most high-profile exposure when it joined R.E.M. for the NOLA-inspired song “Oh My Heart” on the band’s new LP Collapse Into Now. Where Not To Start: There’s nothing wrong with the Dirty Dozen Brass Band. It’s quite good, actually, and none of the previously mentioned bands would be where they are without the influence of Dozen, New Orleans’ most popular brass band and one of the first to blend more modern forms of music with traditional arrangements. But bands like Rebirth and Soul Rebels have continued to update their sound and collaborate with other local artists, particularly hip-hop and bounce artists, creating a more accurate reflection of the current New Orleans music scene. Again, that’s not to say more traditional acts don’t have a place: bands like the Dirty Dozen and Preservation Hall Jazz Band are important in prolonging the tradition of brass band music, and Dirty Dozen has added some hip-hop elements to its music here and there over the years. (Chuck D guested on a 2006 cover of Marvin Gaye’s “What’s Going On?”) But as the more prominent musicians of New Orleans’ brass band scene skew younger, this new generation’s output is following suit, evolving into something newer and fresher, nodding to bands like Dirty Dozen but moving forward into uncharted territory, remapping the cultural landscape of the city as it continues to rebuild and reinvent itself.